This dialog allows the designer to specify the properties of a Note object. A note is a non-electrical drawing primitive. It is used to add informative or instructional text to a specific area within a schematic, in a similar vein to that of commenting a program's source code. The note is a resizable rectangular area that can contain multiple lines of text and can automatically wrap and clip text to keep it within the bounds of the note. For information on how a placed note object can be modified graphically, directly in the workspace, see Graphical Editing. The Note dialog can be accessed during placement by pressing the Tab key. Text Color - click the color sample to change the color used for the actual text entered into the note, using the standard Choose Color dialog. Alignment - specifies the alignment of the text contained within the note. Choose from Center, Left, and Right alignment. Location X1/Y1 - the current X (horizontal) and Y (vertical) coordinates for the bottom-left corner of the note. Edit these values to change the position of this corner in the horizontal and/or vertical planes respectively. Location X2/Y2 - the current X (horizontal) and Y (vertical) coordinates for the top-right corner of the note. Edit these values to change the position of this corner in the horizontal and/or vertical planes respectively. Border Color - click the color sample to change the color used for the border around the note, using the standard Choose Color dialog. Fill Color - click the color sample to change the fill color for the note, using the standard Choose Color dialog. Text Margin - the amount of space (padding) between the text and the note border. The value specified applies equally to Left, Top, Right and Bottom margins for the note. To benefit from the text margin functionality within the area of the note, ensure that the Clip to Area option is enabled. Ideally, the Word Wrap option should also be enabled. Negative margins are also possible, using the minus prefix (-). Author - use this field to enter the name of the person writing the note. Text - click the Change button associated to this field to access the Note Text dialog, from where text for the note can be entered as required. Font - this control serves two purposes. Firstly, it reflects the currently chosen font – applied to the text entered within the note - in terms of Font Name, Font Size and Font Style. Secondly, when clicked it provides access to the standard Font dialog, from where to change the font as required. Collapsed - enable this option to display the note in collapsed (small triangle) mode. Disable this option to display the note in expanded (full frame) mode. 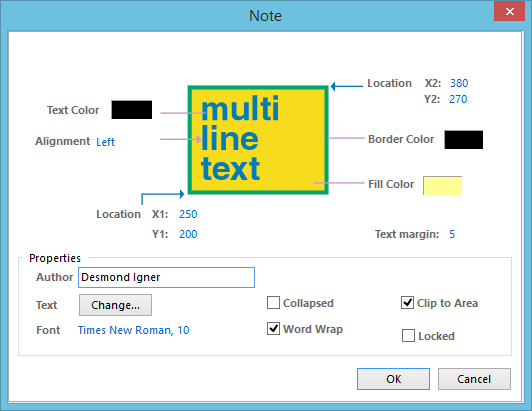 Word Wrap - enable this option to have the text within the note area automatically wrap to fit the width of the note. Clip to Area - this option comes into play if word wrapping is disabled. With this option enabled, text will be kept within the bounds of the note. When disabled, text will spill out of the note onto the schematic sheet. Locked - enable this option to protect the note from being edited graphically.